Michael Gove has urged Tory MPs to back a compromise Brexit plan as the best chance of a “proper” exit from the EU. He told the BBC it was not all he hoped for, but said he was a “realist” and dismissed claims it would leave the UK as a “vassal state”. But he warned the EU had to be more generous or the UK would have no option than to walk away without a deal. Labour also urged the EU to be more flexible but said Theresa May’s customs plan was a “fudge” and would “unravel”. Several Tory MPs have expressed unease since Friday, when the cabinet approved a document setting out the UK’s vision for its future relationship with the EU after it leaves in March 2019. Theresa May challenged the EU to “get serious” about her plan for Britain’s post-Brexit relationship with the bloc amid signs of dissent from Brexiteers in her own party. The U.K. prime minister won the backing of her divided Cabinet Friday for a plan that would create a new “U.K.-EU free trade area” and closely intertwined customs relationship with Brussels. Well the EU considers that Brexit is a UK problem caused by the UK. So far it seems that what the EU is willing to accept is UNACCEPTABLE to the UK. There are serious issues with Northern Ireland as well as Gibraltar that can trash any deal. Furthermore, the Europeans want the UK to pay a big price for Brexit. Does the UK yet get what the Europeans have been telling it? 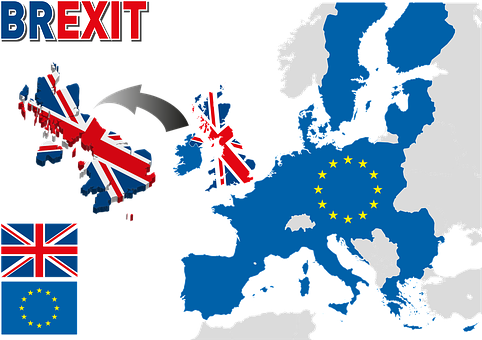 The EU’s basic position is that the UK wanted to be in the EU, the UK approved the Lisbon treaty, and now the UK does not want to fund the EU as it agreed to, but instead wants to leave. The EU does not like that at all and essentially blames the UK for any current and future Brexit-related problems. Well, initially, I do not expect that Brexit will result in doomsday for the UK. However, ultimately it will be worse than shortages of medicine and economic disruptions. The real ‘doomsday’ will come after Europe reorganizes and the Beast arises in Europe (Revelation 17:12-13). He will takeover the USA (Daniel 11:39), as well as its Anglo-Saxon descended allies (cf. Jeremiah 30:7; Daniel 8:23-25a). What is this abomination? This refers to Daniel 11:31 and Matthew 24:15…That will be a time when the UNITED Europe shall appear–the revival of the medieval “Holy Roman Empire.” We shall then be warned, and readied to be taken to a place of refuge and safety from the Great Tribulation. Forty-five days later “the beasts armies” will surround Jerusalem. Thirty days later the Great Tribulation will probably start with a nuclear attack on London and Britain–and possibly the same day or immediately after, on the United States and Canadian cities. The GREAT TRIBULATION, we shall fully then realize, is the time of “Jacob’s Trouble,” spoken of in Jeremiah 30:7. And Jacob’s name was named on Joseph’s sons, Ephraim and Manasseh (Gen. 48:16). At that time a third of the people in our nations will die, or shall have died, by famine and disease epidemics; another third will dies of the war–our cities being destroyed (Ezek. 6:6), and the remaining third will be carried to the land of our enemies as slaves (Ezek. 5:12). (Armstrong HW. The Time We Are In, Now. Pastor General’s Report-Vol 1, No. 15, November 20, 1979, Page 2). The Great Tribulation, which I have called, World War III will come. Brexit (and Donald Trump) will be factors. 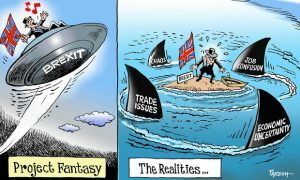 The fact of Brexit and the EU’s response to it have been pushing the Brits to conclude that they need to move closer to the USA, and farther from Europe, on some matters. The fact of Donald Trump has been to push the Europeans to increase military cooperation and to move further away from the USA. But either way, the EU considers Brexit a UK problem and is probably not thrilled with Theresa May’s comments that it needs to “get serious” about Brexit. This entry was posted on Sunday, July 8th, 2018 at 3:00 pm	and is filed under Prophecy.